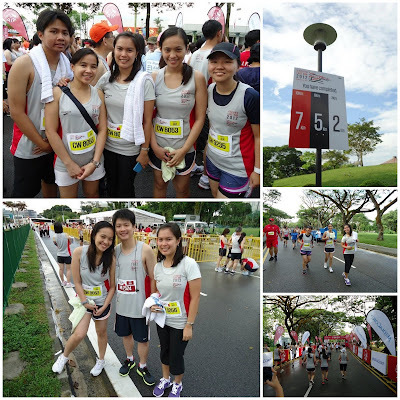 Tee's Blurbs: my first ever run. EVER. on the drive for a healthier lifestyle, J and I try to run often (at least walk or sprint for me) but unfortunately, being lazy and all, we always find an excuse not to (the rain is a favorite reason) ! it's a shame really, living just beside the huge park. here are some photos of my first even run. i just joined the 3K fun-run. what was fun was that after the run, there was an event and a carnival where booths and games were set-up, and everything was for free. the event organizers had prepared series of activities for the participants. if i hadn't known, it looks like it wasn't a run at all! they were giving out icecream and you can go to the photobooth and have your photos taken for free! J+K, ready to (run)rumble! J did the 6K, i did the 3K.